Last night, while listening to the radio, the person being interviewed used the words 'superluminous beings' and the light in the room came on by itself with a humming - whooshing sound and flashed bright and then dimmed down to darkness again. The light didn't click on and off like when you turn it on by itself. As I woke up, I heard a bell ring in my left ear and an inner voice said, "This disclosure will awaken the world." "The simple, absolute and immutable mysteries of divine Truth are hidden in the super-luminous darkness of that silence which revealeth in secret. For this darkness, though of deepest obscurity, is yet radiantly clear; and, though beyond touch and sight, it more than fills our unseeing minds with splendours of transcendent beauty. . . ."
This is a partial record of a meditation on a Perennialist mystical writing. The writing is by an unknown author who called himself Dionysius the Areopagite. To highlight the characteristics of upheaval and epiphany that occur during contemplation of a mystical composition, we'll scrutinize each segment by itself. "The simple, absolute and immutable mysteries of divine Truth are hidden in the super-luminous darkness of that silence which revealeth in secret. Having illustrated how a meditation proceeds, continue along the same lines with the remainder of the mystical formulation. "The simple, absolute and immutable mysteries of divine Truth are hidden in the super-luminous darkness of that silence which revealeth in secret. For this darkness, though of deepest obscurity, is yet radiantly clear; and, though beyond touch and sight, it more than fills our unseeing minds with splendours of transcendent beauty. . .
"For this is not unlike the art of those who carve a life-like image from stone; removing from around it all that impedes clear vision of the latent form, revealing its hidden beauty solely by taking away. For it is, as I believe, more fitting to praise Him by taking away than by ascription; for we ascribe attributes to Him, when we start from universals and come down through the intermediate to the particulars. But here we take away all things from Him going up from particulars to universals, that we may know openly the unknowable, which is hidden in and under all things that may be known. And we behold that darkness beyond being, concealed under all natural light." The Nameless Goodness is not only the cause of cohesion or life or perfection in such wise as to derive Its Name from this or that providential activity alone; nay, rather does It contain all things beforehand within Itself, after a simple and uncircumscribed manner through the perfect excellence of Its one and all-creative Providence, and thus we draw from the whole creation Its appropriate praises and Its Names.
. Moreover, the sacred writers proclaim not only such titles as these (titles drawn from universal or from particular providences or providential activities), but sometimes they have gained their images from certain heavenly visions (which in the holy precincts or elsewhere have illuminated the Initiates or the Prophets), and, ascribing to the super-luminous nameless Goodness titles drawn from all manner of acts and functions, have clothed It in human (fiery or amber) shapes or forms, and have spoken of Its Eyes, and Ears, and Hair, and Face, and Hands, and Wings, and Feathers, and Arms, and Back Parts, and Feet; and fashioned such mystical conceptions as its Crown, and Throne, and Cup, and Mixing Bowl, etc., concerning which things we will attempt to speak when we treat of Symbolical Divinity. At present, collecting from the Scriptures what concerns the matter in hand, and employing as our canon the rule we have described, and guiding our search thereby, let us proceed to an exposition of God’s Intelligible Names; and as the Hierarchical Law directs us in all study of Divinity, let us approach these godlike contemplations (for such indeed they are) with our hearts predisposed unto the vision of God, and let us bring holy ears to the exposition of God’s holy Names, implanting holy Truths in holy instruments according to the Divine command, and withholding these things from the mockery and laughter of the uninitiate, or, rather, seeking to redeem those wicked men (if any such there be) from their enmity towards God. Thou, therefore, O good Timothy, must guard these truths according to the holy Ordinance, nor must thou utter or divulge the heavenly mysteries unto the uninitiate. And for myself I pray God grant me worthily to declare the beneficent and manifold Names of the Unutterable and Nameless Godhead, and that He do not take away the word of Truth out of my mouth. 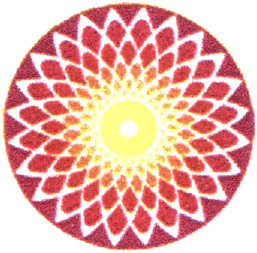 "Radiating from the center (of the vastupurusha mandala) is its effulgence, the light of all suns that ever shone and which in repeated cycles illumine this universe. This light of all suns is carried by the Regents of 12 Suns, the Adityas.... The light is carried across this inner border and to the outer rim with its four orients in the middle of each side." The central core of both versions of the diagram is called the Place of Brahman (Brahmastana). It corresponds with the Embryo of Splendour (hiranyagarbha) that is featured in various Hindu tales of creation, where it is represented as "...the primordial germ of cosmic light.... In the center is the dark source of all light, the super luminous darkness, the central point beyond all time.... It radiates from there and its radiance proceeds through all the stations of the Regents of sun and stars, placed on the body of the Vastupurusha.... From the center beyond time, and around it, is displayed cyclical time in its sections, in its units of days, months and years and in the cycles in which the different courses of sun and moon are adjusted." Dionysian apophatism reached its culmination in Meister Eckhart, who spoke of the “desert of the Godhead”, and in St. John of the Cross, who wrote about the “Dark Night of the Soul”. Although apophatic (via negativa) mysticism dominated spiritual life in the West, cataphatic (via positiva) mysticism was also quite popular, especially with women saints. Raymond Moody reasons that most people having NDE's have essentially the same vision, even though they may overlay it with different culturally inherited forms'. In fact one suggestion made in the IANDS News Bulletin (Spring 1990), that discussed the features arising from the NDE, is that the communication that takes place with the being, if it occurs, is 'the subject conversing with the superluminous Self...The whole thing looks like a conversation between the part and the whole'. In other words, the person is confronting their own being - as it should be, and is destined to become. But for a fully developed theology of this extraordinary claim, one must turn to Eastern Orthodox Christianity, and particularly to the great St. Gregory Palamas (1296-1359). The Triads of Palamas were composed to defend the claim of the hesychasts—hermit monks of Mt. Athos—that through certain ascetic practices, including the repetition of the "Jesus prayer" ("Lord Jesus Christ, Son of God, have mercy on me, a sinner"), they were able to achieve sight of God’s uncreated divine light, the same light He displayed to Peter, James and John in the Transfiguration, traditionally considered to have taken place on Mt. Tabor: "[He] was transfigured before them: and his face did shine as the sun, and his raiment was white as the light" (Mat. 17.2). "… [H]e was transfigured before them. And his raiment became shining, exceeding white as snow; so as no fuller on earth can white them" (Mark 9.2-3). "And as he prayed, the fashion of his countenance was altered, and his raiment was white and glistering" (Luke 9.29). Here then is a claim of access to transcendent knowledge achievable in this world by human faculties in synergy with God’s grace. It is the ultimate claim of Realist metaphysics, an option still being exercised by living contemporaries of ours. Consciousness can expand beyond the limited definition of finite individual cultural perception into the true condition: universal symbolic awareness. The mind demonstrates what amounts to an intrinsic structure which does not depend on any particular culture for expression, nor any culture at all, for that matter. Apart from the basic neurological and instinctual mechanisms which tend to ensure functional survival, a fairly complex and systematically organized series of internal conscious states exists which can (and will) be experienced by the individual who makes the journey beyond the “normal.” These states are encountered in a sequence of levels or “planes” very aptly described as Chakras (literally “wheels”) in the Hindu religious tradition, culminating in the seventh, highest humanly knowable, Chakra, Sahasara. The seventh plane is experienced in the state of Samadhi – complete release from personal/cultural/ego based consciousness, in the presence of God, described as an all-present super-radiant thousand petaled Lotus blossom. In Sanskrit (the ancient Hindu language), the term “one thousand” actually implied “one million,” or that which is functionally infinite in number. So we have something like an omnipresent field of radiant energy with a countless number of emanations. Hebrew is one of a few languages in the modern world which is still composed of essentially the same esoteric alphabetical symbol set which has existed intact for thousands of years. Sanskrit, Runescript, and Hieroglyphics, are other significant examples. In each case, the individual “letters” of the system have intrinsic meaning, quite apart from their combined expression in generic language. In fact, an apparently mundane word can have a long and complex hidden meaning which is very spiritual in content. In ancient times, a letter or a complete alphabet were magical, spiritual things which symbolized important aspects of the existence of humanity and society. The Manasic, or mind principle, is cosmic and universal. It is the creator of all forms, and the basis of all law in nature. Not so with consciousness. Consciousness is a condition of the monad as the result of embodiment in matter and the dwelling in a physical form. Self-consciousness, which from the animal plane looking upward is the beginning of perfection, from the divine plane looking downward is the perfection of selfishness and the curse of separateness. It is the "world of illusion" that man has created for himself. "Maya is the perceptive faculty of every Ego which considers itself a Unit, separate from and independent of the One Infinite and Eternal Sat or 'be-ness." The "eternal pilgrim" must therefore mount higher, and flee from the plane of self-consciousness it has struggled so hard to reach. The complex structure that we call "Man" is made up of a congeries of almost innumerable "Lives." Not only every microscopic cell of which the tissues are composed, but the molecules and atoms of which these cells are composed, are permeated with the essence of the "One Life." Every so-called organic cell is known to have its nucleus, a center of finer or more sensitive matter. The nutritive, all the formative and functional processes consist of flux and re-flux, of inspiration and expiration, to and from the nucleus. The nucleus is therefore in its own degree and after its kind a "monad" imprisoned in a "form." Every microscopic cell, therefore, has a consciousness and an intelligence of its own, and man thus consists of innumerable "lives." This is but physiological synthesis, logically deduced no less from the known facts in physiology and histology than the logical sequence of the philosophy of occultism. Health of the body as a whole depends on the integrity of all its parts, and more especially upon their harmonious association and cooperation. A diseased tissue is one in which a group of individual cells refuse to cooperate, and wherein is set up discordant action, using less or claiming more than their due share of food or energy. Disease of the very tissue of mans body is neither more nor less than the "sin of separateness." Moreover, the grouping of cells is upon the principle of hierarchies. Smaller groups are subordinate to larger congeries, and these again are subordinate to larger, or to the whole. Every microscopic cell therefore typifies and epitomizes man, as man is an epitome of the Universe. As already remarked, the "Eternal Pilgrim," the Alter-Ego in man, is a monad progressing through the ages. By right and by endowment the ego is king in the domain of mans bodily life. It descended into matter in the cosmic process till it reached the mineral plane, and then journeyed upward through the "three kingdoms" till it reached the human plane. The elements of its being, like the cells and molecules of mans body, are groupings of structures accessory or subordinate to it. The human monad or Ego is therefore akin to all below it and heir to all above it, linked by indissoluble bonds to spirit and matter, "God" and "Nature." The attributes that it gathers, and the faculties that it unfolds, are but the latent and dormant potentialities awaking to conscious life. The tissue cells constitute mans bodily structure, but the order in which they are arranged, the principle upon which they are grouped, constituting the human form, is not simply an evolved shape from the lower animal plane, but an involved principle from a higher plane, an older world, viz, the "Lunar Pitris." "Hanuman the Monkey" antedates Darwins "missing link" by thousands of millenniums. So also the Manasic, or mind element, with its cosmic and infinite potentialities, is not merely the developed "instinct" of the animal. Mind is the latent or active potentiality of Cosmic Ideation, the essence of every form, the basis of every law, the potency of every principle in the universe. Human thought is the reflection or reproduction in the realm of mans consciousness of these forms, laws, and principles. Hence man senses and apprehends nature just as nature unfolds in him. When, therefore, the Monad has passed through the form of the animal ego, involved and unfolded the human form, the higher triad of principles awakens from the sleep of ages and over-shadowed by the "Manasa-putra" and built into its essence and substance. How could man epitomize Cosmos if he did not touch it at every point and involve it in every principle? If mans being is woven in the web of destiny, his potencies and possibilities take hold of divinity as the woof and pattern of his boundless life. Why, then, should he grow weary or disheartened? Alas! why should he be degraded, this heir of all things! Since nature avails naught and human endeavor but little, little should be attributed to inquiry, but much to unction; little to the tongue, but very much to interior joy; little to the spoken or written word, but everything to the Gift of God, that is, to the Holy Spirit. Little or nothing should be attributed to the creature, but everything to the creative essence - the Father, the Son, and the Holy Spirit. And thus, with Dionysius, we address the Triune God: "O Trinity, Essence above all essence, and Deity above all deity, supremely best Guardian of the divine wisdom of Christians, direct us to the supremely unknown, superluminous, and most sublime height of mystical knowledge. There new mysteries - absolute and changeless mysteries of theology - are shrouded in the superluminous darkness of a silence, teaching secretly in the utmost obscurity that is manifest above all manifestation; of a darkness that is resplendent above all splendor, and in which everything shines forth, of a darkness which fills invisible intellects full above all plenitude with the splendors of invisible good things that are above all good." So much let us say to God. To the friend, however, for whom these words were written, we can say with Dionysius: "And you, my friend, in this matter of mystical visions, redouble your efforts, abandon the senses, intellectual activities, visible and invisible things - everything that is not and that is - and, oblivious of yourself, let yourself be brought back, in so far as it is possible, to unity with Him Who is above all essence and all knowledge. And transcending yourself and all things, ascend to the super-essential gleam of the divine darkness by an incommensurable and absolute transport of a pure mind." If you wish to know how these things may come about, ask grace, not learning; desire, not the understanding; the groaning of prayer, not diligence in reading; the Bridegroom, not the teacher; God, not man; darkness, not clarity; not light, but the fire that wholly inflames and carries one into God through transporting unctions and consuming affections. God Himself is this fire, and His furnace is in Jerusalem; and it is Christ who enkindles it in the white flame of His most burning Passion. This fire he alone truly perceives who says: My soul chooseth hanging, and my bones, death. He who loves this death can see God, for it is absolutely true that Man shall not see me and live. Let us, then, die and enter into this darkness. Let us silence all our care, our desires, and our imaginings. With Christ crucified, let us pass out of this world to the Father, so that, when the Father is shown to us, we may say with Philip: It is enough for us. Let us hear with Paul: My grace is sufficient for thee, and rejoice with David, saying: My flesh and my heart have fainted away: thou art the God of my heart, and the God that is my portion forever. Blessed be the Lord forever, and let all the people say: so be it, so be it. Amen.